This is one of those recipes where I took a cooking technique from another recipe that completely changes the dish. I have been making variations of this dish for most of my cooking life, but it rarely came out how I knew it should be. For me this has been a dish in constant evolution, I do not think I have ever made it the same way twice. This is the first time I have even written it down. Originally, as my mother would have made this dish, I would sauté the onions, add the rice, vegetables, rice, any herbs & spices, fluid and then walk away while it cooked until the rice was tender. However, instead of fluffy, flavorful, interestingly textured rice and vegetables, this technique would more often than not result in a sticky, unattractive mess with under-cooked wild rice and overcooked vegetables. While the dish might end up tasting OK, it left a lot to be desired. The first basic problem I tackled was the wild rice. 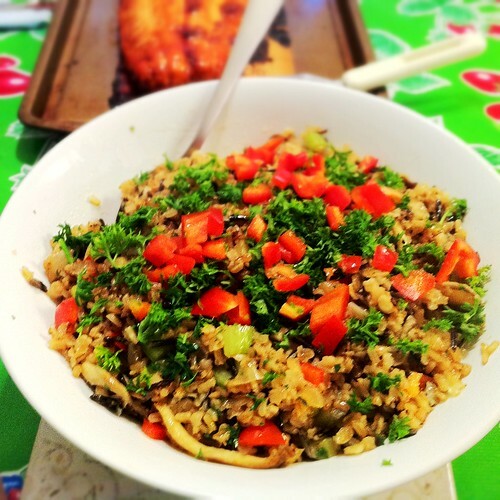 Wild rice takes longer to cook than white rice. To solve this problem I par-cooked the wild rice in chicken stock. Unless you are a Vegan, most rice dishes are helped by adding a little chicken stock. I boiled the wild rice in a small pan to give it a 15 minute head start. A second problem was the raw vegetables. When the raw vegetables were just dumped in to cook with the rice they would release their own fluids and that would cause the white rice to overcook. Simply reducing the cooking fluid was a problematic solution. Sometimes the rice would come out undercooked and other times it would come out soggy. It was extremely difficult to find exactly the right balance of fluids. Sautéing the vegetables to get them to release most of their moisture (and to develop more complex flavors) helped with the rice problem, but it created a new one. When the sautéed vegetables were cooked with the rice they would become overcooked, mushy and bland. Most of the vegetables’ flavor was released into the rice, giving the dish a good taste, but the texture of the vegetable bits was disappointing. This technique, of sautéing the vegetables and then cooking everything together, is common to many rice dishes worldwide. One solution to the overcooked vegetable problem, that many of these recipes include, is to sauté the rice in butter or oil before adding the fluid and vegetables. The precooking has two effects: it shortens the time that the rice spends in a wet cooking environment, and coats the individual grains of rice with fat which slows down their absorption of the water. Instead of simply sucking up all of the moisture available leaving soggy rice, the boiling fluid steams the rice, leaving light, fluffy grains. This technique helped, but there still remained the problem with the overcooked vegetables. A few weeks ago, I finally found the secret technique to solve the problem while I was looking for Mexican Rice recipes. Most of the recipes id found used the dump everything in and simmer until done method. I had tried many recipes like these in the past and gotten the predictable results of soggy Mexican rice that looks nothing like you would find in any good Mexican restaurant. One site (Mel’s Kitchen Cafe) however used a new technique which he had gotten from another site (Homesick Texan). She in turn had gotten the technique from a bookstore coworker of Mexican dissent (who had gotten it from her mother etc.). Like many other simple and obvious techniques that come from family recipes, some things are considered to be to basic and are usually left out of the instructions. (Like the time I asked a Japanese friend how much miso goes into Miso soup. All I got was a look of confusion and the statement, “Enough.”) If you grew up in your mother’s kitchen, watching her making the dish, you already knew this technique. It did not need to be written down, it was too obviously the way the dish was made. And the simple and secret technique is: cook the rice and vegetables separately and only combine them at the very end. This technique is good for many rice dishes, because it gives you complete control over the disparate elements. Depending on the dish, the rice may be cooked ahead of time and reheated. If you want your vegetables sautéed crisp tender, you may do so at the last minute before you add them to the final dish. But if the sauce needs to be cooked down and thickened you may do that as well. This technique may use an extra pan or two, but the result is well worth the effort. Making this dish was a true test of my discussion here. My wife wanted me to make this dish with brown rice, which is something I tend not to cook with, but I will if she really wants it. 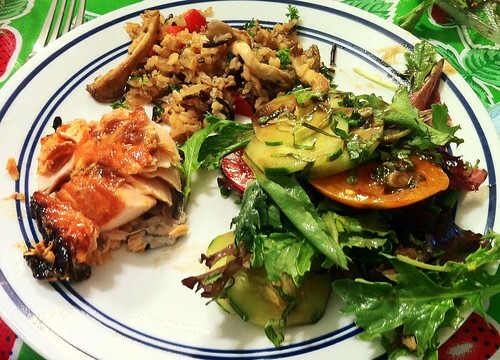 When my salad and salmon was ready, the brown rice was still very chewy and nowhere near done. The salad could wait without harm and I tented the salmon with tin foil. I turned up the heat on the rice and added another ½ cup of water. Fortunately, the vegetables for the dish were chopped and ready to sauté, but still uncooked. The rice eventually needed a second ½ cup of water and another 20 minutes of cooking before they were tender. If I had added the vegetables at the beginning this would have been another disappointment, the vegetables would have been way overcooked by the time the rice was done. Instead the resting of the salmon enhanced its flavor and the rice pilaf came out perfectly. This meal was a memorable success, topped off with a summer berry pie made by my wife. 1. Simmer the wild rice in a small pot with ½ cup chicken stock for 15 minutes. 2. Put 1 Tbs. olive oil in a medium pot and sauté the white rice until it is starting to color. 3. Drain any remaining fluid into a 2 cup measuring cup and add the wild rice and the bay leaf to the larger pot. 5. Bring the rice to a boil and then cover and turn to a low simmer. Cook until the moisture is absorbed and the grains are tender (about 20 minutes). Remove from heat and let stand for 5 minutes. 6. Just before the rice is finished cooking, in a large pan sauté mushrooms in ½ the remaining olive oil until browned. Remove mushrooms from pan and set aside. 7. Sauté the onions in the remaining ½ Tbs. of olive oil until just starting to pick up some color. 8. Add the celery and continue cook until crisp tender. 9. Add the garlic, herbs and pepper and cook one minute more. 10. Return the mushrooms to the pan and add the remaining ½ cup of chicken stock and simmer for 2 minutes. 11. Fluff the rice and add it, the sherry vinegar, and most of the red pepper and parsley to the pan and mix well. Adjust salt and pepper as needed. 12. Move to a serving dish and garnish with the remaining peppers and parsley.